A massive manhunt for the people who opened fire on a holiday party outside of Los Angeles ended Wednesday afternoon with a man and a woman, both suspected shooters, dead and a third person detained, police said. Fourteen people were killed and 17 wounded at a social services facility east of Los Angeles, according to the San Bernardino Police Department. Police initially sought up to three gunmen, but now believe the two people killed in a gun battle later Wednesday were the only gunmen involved in the deadly shooting — the worst in the U.S. since 2012. Police identified the suspected attackers as Syed Rizwan Farook, 28, an American who worked five years for the County of San Bernardino, and Tashfeen Malik, 27, whose nationality was unknown. Police said the two were believed to be either engaged or married. "I am in shock that something like this can happen," Farhan Khan, Farook's brother-in-law, said at a press conference Wednesday evening. "I hope everyone can understand and (that) the victims recover out there." Farook and Malik were armed with "essentially" .233 caliber assault rifles and semi-automatic handguns, according to San Bernardino Police Chief Jarrod Burguan. Police also found three explosives at the scene of the shooting. 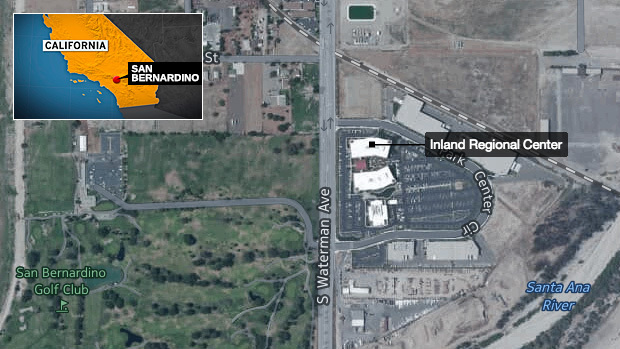 The suspects were killed in a shootout in San Bernardino hours after they allegedly armed themselves and walked into a holiday party at the Inland Regional Center on the 1300 block of S. Waterman Avenue, where terrified people barricaded themselves in rooms to keep safe from the gunfire. The facility serves people with developmental disabilities, according to the San Bernardino Police Department. Hundreds of people were inside at the time. Police said Farook attended the holiday party and left "under some circumstances that were described as angry" prior to the shooting. Gunfire erupted between 10 and 30 minutes after Farook left, according to Burguan. Burguan and San Bernardino Mayor Carey Davis said they were told there was a dispute at a party. 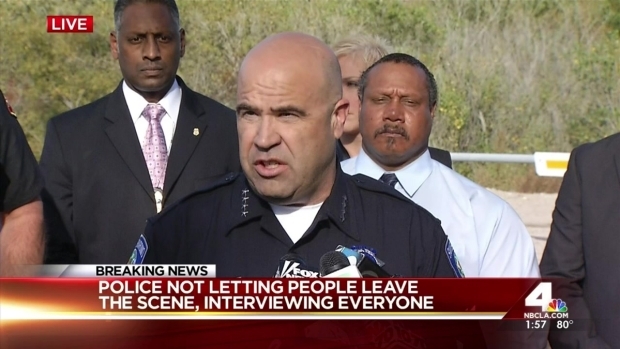 The San Bernardino Police Chief spoke out to the public for the first time, warning that suspects had fled after a mass shooting left at least 14 dead Wednesday, Dec. 2, 2015. Images from the scene showed law enforcement personnel armed with rifles and wearing protective gear fanning out across the area, as emergency responders treated multiple victims in the street. "This is truly a tragedy in our country," said FBI Los Angeles Director David Bowdich, who would not rule out that the shooting could have been a terrorist attack. "It is a possibility, but we don't know this yet." Burguan said during an earlier press conference police had "no information at this point to indicate that this is terrorist related in the traditional sense" but added that, "at a minimum, we have a domestic terrorist-type situation that occurred here." Burguan described the shooters as "well prepared" and "on a mission." The death toll marked the deadliest mass shooting in the U.S. since 26 children and elementary school staffers were killed in Newtown, Connecticut, in 2012. 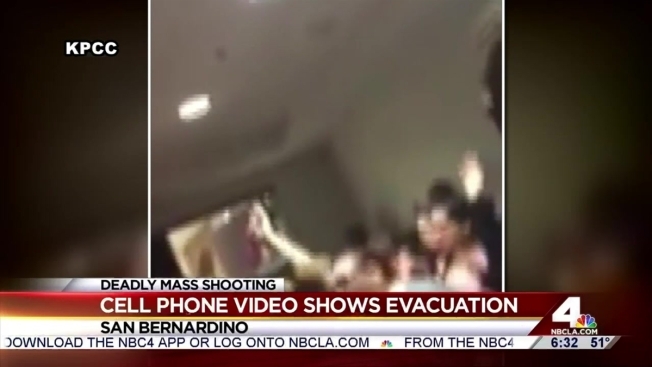 "We all should go home tonight with our loved ones and just understand that this can happen at any time," said Loma Linda Medical Center spokeswoman Briana Pastorino, at the end of a press conference. "We hear of these mass shootings all over the country. And I believe you would all agree that this hit a little bit too close to home. It is home." A tip led police later in the day to a home in Redlands, from which the suspects led police on a chase. 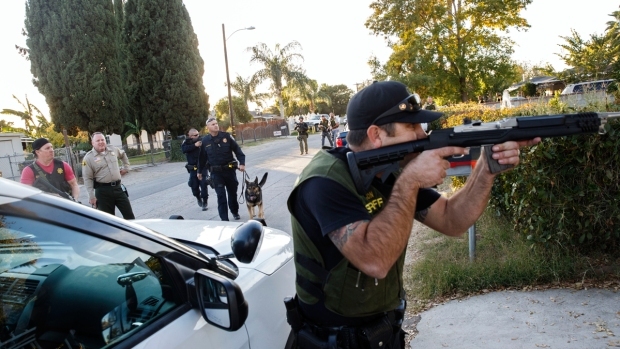 In the afternoon, authorities swarmed a bullet-riddled SUV in San Bernardino during a manhunt for the suspects. The two suspects killed by police were "dressed in assault style clothing," Burguan said. A police officer suffered non-life-threatening injuries in the gun battle. A third person seen running from the police shootout was detained, but it's not clear if that person was related to the massacre. Multiple agencies, including the FBI and ATF, were assisting with the investigation. The Inland Regional Center serves more than 31,000 people with developmental disabilities in San Bernardino County and neighboring Riverside County, according to the center's website, which calls it "a nonprofit, private community-based agency that is proud to help obtain services and support for our constituents." One man at the scene said his daughter, who works at the center with the mentally disabled, had texted him to say she was hiding in a closet with other people. Another man told NBC4 Los Angeles his sister has cerebral palsy and attends the center. NBC Los Angeles photographer Alex Vasquez made his way to the Inland Regional Center soon after the shooting and said he saw many people with severe injuries. Some people he spoke to were in shock. "They heard many gunshots. A lot of people were just yelling for their loved ones," he said. President Barack Obama said California's massacre reminded him of a pattern of mass shootings in the U.S. that "has no parallel anywhere else in the world." California Gov. Jerry Brown issued a statement saying in part, "Our thoughts and prayers are with the victims' families and everyone affected by the brutal attack. California will spare no effort in bringing these killers to justice." Jason Kandel and Asher Klein contributed to this report.